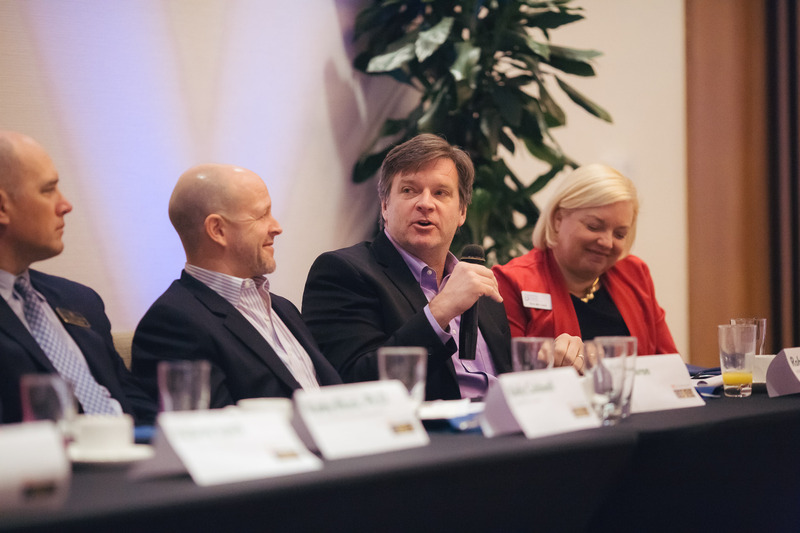 It is no secret that Sarasota is a giving place made up of giving people that work for giving companies and own giving businesses. 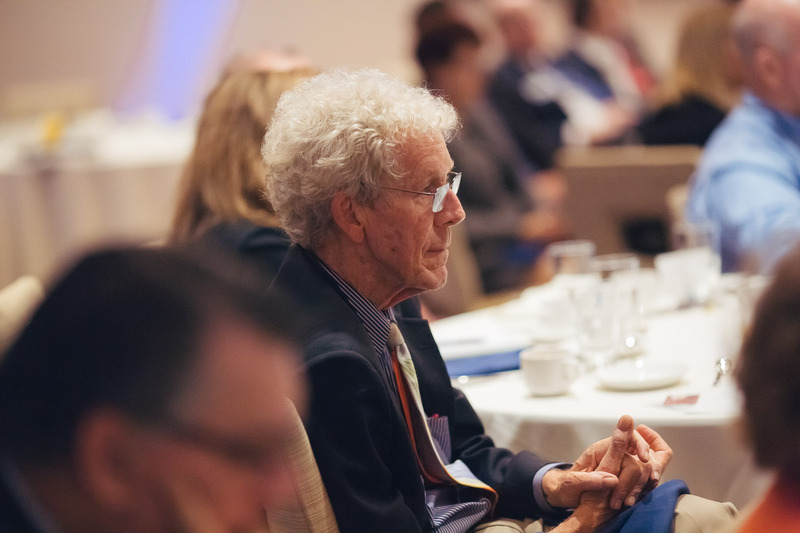 The high occurrence of philanthropically planned discussions and forums throughout the year are an indicator that our community and non-profits are hungry for innovations in donor relations, maximizing giving potential and making the most of instruction in charitable opportunities. Yesterday, SRQ | The Magazine hosted a sold-out SB2 breakfast, The Art of Corporate Philanthropy, at The Francis in downtown Sarasota. As guests filled their plates with a delicious spread morning favorites (we are partial to the bacon), Jeff Mayers of the Resort at Longboat Key Club welcomed those in attendance and spoke to the importance of company-wide giving. The resort is known for giving to a variety of community organizations that serve at risk populations, foster a strong sense of community and develop our region through economic and the business sector. Before introducing the keynote speaker, Steve Ellis of MGB Homes proudly introduced his company’s dedication to corporate giving. “All of our employees are given one day a month to volunteer their time to worthy causes in the community,” said Ellis. Additionally, MGB Homes proudly supports various causes in the community. Ellis recognized the importance of corporations like Wells Fargo & Company, represented by the keynote speaker, setting the standard for investment in operations that make life better for so many. Each year, Wells Fargo & Company ranks amongst the most charitable organizations in Florida. Since 2011, the company has given over $1.1 billion to organizations and people who make a difference. In the state of Florida, Wells Fargo consistently ranks among the top most giving institutions and has an active community relations group dedicated to the distribution of funds in the areas of community development, education, human services, arts and culture, civic engagement and the environment. Quite simply, Wells Fargo & Company is funding causes that matter through a process that speaks to its obvious culture of corporate philanthropy. Leading this corporate culture of generosity in Florida is Connie E.W. Smith, Wells Fargo Diverse Community Capital Program Manager and keynote speaker at The Art of Corporate Philanthropy. When describing why Wells Fargo is dedicated to giving back, Smith shared a portion of Wells Fargo’s vision and values with us, “This is not about charity. It’s about intelligent and thoughtful investing in the future of the communities where our team members and customers live and work.” In an age where businesses are constantly petitioned to give, making philanthropic decisions that give and keep giving to individuals in our backyards is important. Wells Fargo invests in the missions of organizations and in causes where their expertise makes a difference, like Hands on Banking®, which prepares young people, seniors and military for financial independence with basic budgeting, foundational banking skills and how to save. Local panelists Kelly Caldwell of Caldwell Trust Company, Rod Hershberger of PGT Industries, Lisa Krouse of FCCI Insurance Group and Aubrey Lynch of CS&L CPAs gave a thoughtful feedback on what it means to be a company dedicated to giving. 1. Giving is all about relationships. Time after time, our panelists shared stories about how their corporate giving is dramatically influenced by the support and at the request of their employees, regardless of the level of leadership within the company. “We get our direction from our employees,” said Lisa Krouse. “They are our compass.” When an FCCI employee cares about a cause and requests assistance via funding or volunteerism, the company listens. For non-profits, expanding their reach to connect with businesses like FCCI Insurance Group pays off with loyalty to their mission. In the devastating aftermath of weather events that recently affected Haiti, PGT Industries did more than the average company would do, and for good reason. “We have 90 employees with ties to Haiti. Collectively, they had over 700 family members that were affected. So we shipped supplies that met their immediate needs,” said Rod Hershberger. And the reason why they went through numerous channels to make it happen? Because it mattered tremendously to the PGT Industries employees and therefore mattered to Rod and the entire PGT Industries team. 2. Cultivating a corporate culture of giving is easier than you think. Making a commitment to giving doesn’t have to follow a set formula: hours + dollars = a charitable mission, isn’t the case for every company. And it doesn’t have to be. This changing workforce demographic of younger people often means that new recruits are looking for a corporate giving structure off the bat. All of the panelists agreed that their giving is not done to draw attention to the company or for a feigned expression of generosity, many noted that sharing the corporate giving policy with potential employees has become a very important part of the hiring process. “Giving is now becoming a bigger part of recruitment. It is important for young professionals, and when there is a decision to be made on an offer, young professionals are looking for corporate giving,” said Krouse. But it is also worth noting that the companies also gain insight on a future employee by sharing their corporate giving strategy. As the head of recruitment for CS&L CPAs, Aubrey Lynch admitted the importance of knowing whether a recruit will be a good match for the company based on this one telling question. Of all that we learned, we can’t wrap up this post without mentioning a quote that very simply and eloquently summed up the entire morning. Panelist Lisa Krouse said, “Generosity binds people.” In a packed room full of philanthropists, business executives and everyone in between, she couldn’t have been more right. The generosity of Sarasota has a way of binding our community in a way like no other shared interest. It has the power to bind employees and give them a sense of pride for that they do and who they work for, and it has the power to fill a room with people who care about giving back – even at 7:30 in the morning. The SB2 series is loyally supported by The Resort at Longboat Key Club, CS&L CPAs and The Sarasota-Bradenton International Airport. The keynote speaker for The Art of Corporate Philanthropy was supported through a sponsorship by MGB Homes. Special thanks to our panelists who spoke so candidly about their giving initiatives and to Connie Smith for her diligent work on behalf of Wells Fargo for enriching the state through impactful corporate giving. To view a gallery of photos from the event, click here. Tickets for the full 2015-2016 SB2 Series are available online at SRQSB2.COM. At SB2 last week, a crowd gathered early to get an answer to a big question: is retirement still retirement? We, too, were curious. In fact, we were so curious that we assembled some of the most knowledgeable people we know in their respective fields to get their perspective. We had a lot of ground to cover – from financial and estate planning to employment opportunities for the aging, life expectancies and even universal design. But with the help of our esteemed panelists, we got some answers and feel better prepared to navigate the road ahead. Aubrey Lynch of CS&L CPAs served as the opening presenter. Specializing in estate planning, Aubrey provided the perfect introduction for the symposium. Florida is an attractive state for relocation – and retirees in particular, due to the state’s friendly tax environment. In serving families that have lost a loved one, or a surviving spouse, Aubrey reminded those in attendance that when planning for the future proper communication is the most valuable preparation anyone can provide. 1. If you can, work longer. 2. As you age, utilize the resources available to maintain a high quality of life. Take advantage of programming that will keep you engaged, social and involved. Erin McLeod of The Friendship Centers touched on the importance of caring for seniors on both ends of the socioeconomic spectrum. “The Rubin Center for Healthy Aging serves low income seniors over the age of 50. Serving them are retired doctors and health care professionals. In the parking lot is everything from bicycles to Lexuses.” Erin also introduced us to a new word, “workateering” – she has met many senior volunteers throughout the years with storied careers that need an outlet. They are committed to keeping themselves sharp and active by working or volunteering in their field for a small amount of pay. Though it may be uncomfortable, make your wishes known. It is never too early. All too often, surviving family members spend the time immediately following the death of a loved one engaged in a legal battle over assets. “Get your plans done so that the legacy you leave is not that your kids don’t speak to each other” says Kelly Caldwell. 4. Get ready, we’re about to be front and center. The bottom line is that there are an incredible amount of resources in our community for the elderly and aging to get involved, to work, to volunteer and to effectively plan for the road ahead. Special thanks to CS&L CPAs for sponsoring this event and recognizing the importance of this topic in our community. To view photos of the event, click here.